The Camí de Cavalls, literally "the Way of Horses", is a historic look-out bridleway, deeply engraved in the Menorquin identity. It gives you the opportunity to discover the most beautiful scenery as a hiker, horse rider or cyclist guiding you over red-sand coves and contorted headlands on the gnarled northern coastline. The origins of this former bridleway are not very well known. In the 14th century there had already been some tracts enabling the defense of the island, and later the construction of coastal watchtowers to defend to island against pirates made it necessary to build a trail for soldiers and their horses enabling them to cirumnavigate the island. In the 18th century the British administration considered it as a Royal Path and parallely it was used as a public communications route. The bridleway had fallen into disuse, but since 2010 it is now totally passable. 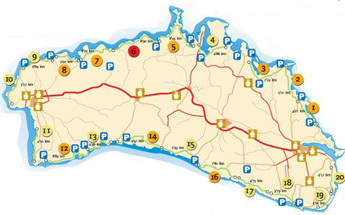 The Camí de Cavalls has a total length of 185 kilometres that follow Menorca's coastline, and is divided into 20 sections. You may start at any point, although officially kilometer zero is situated at the Colàrsega (end) of the Mahón harbour, where section No. 1 begins. The trail is recognised as a long-distance trail GR 223; the route is well waymarked every 50 to 100 metres with wooden pegs as on the photograph in the upper left corner, though the path is not always obvious. There are more than 100 gates to pass which means that traditional activities like cow-breeding are still active along this trail. The route is split into sections, each with its own map. The best months for walking on Menorca are probably April, May, June, September and October, when it willl be warm enough, but not too hot. July and August tend to be very hot months. The 185 kilometers (110 miles) can be completed in about 2 weeks. You should factor in half as much again on your normal timings to allow for the heat and humidity. That certainly depends on the time of the year, although sandals are definitely not the right footwear! If you are walking on the trails often, a good pair of walking shoes will suffice. Boots are not really necessary but could be handy on some of the more difficult treks, like the Cova des Coloms. Remember to take some shower-proof clothing for the occasional wet day. If you are interested in bird-watching, late April would be an ideal time to visit Menorca. Check out rural accomodation with guided family or individual excursions! This book has very detailed descriptions of 40 different walks throughout Menorca. GPS users will appreciate the waypoint descriptions clearly labeled in the book to check that you're in the right location.